From 2006 to 2009, the IwB had been working on the World House project, broadly looking at the evolution of human shelter and the need for contemporary housing and building reform. In particular, from fall 2008 to spring 2009, the IwB was studying rural renewal in the Guanacaste region of Costa Rica, among other issues, looking at the region’s need for social housing (Costa Rica Project). 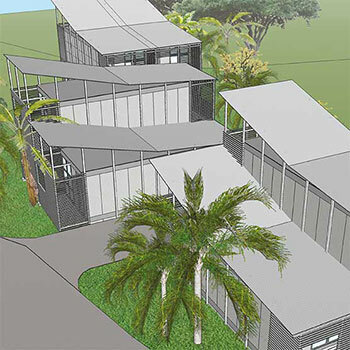 By the end of the academic year, the IwB students had designed a 60 square metre social housing prototype unit calling it the Costa Rica/ Guanacaste House. To develop a design for an affordable modular housing system that is closely aligned with the mandates of the World House initiative and employs design practices that have minimal environmental impact. Internationally, the delivery of shelter can be achieved using similar techniques and strategies. It’s the system underlying housing construction that we need to reevaluate. Two charrette teams were asked to develop a housing system with one schematic concept in two site variations. The intention was to then test the housing system on the two existing sites. The first site in Portero, Costa Rica, was chosen because the IwB had an ongoing partnership with the Costa Rican Ministries of Culture and Housing and because the Guanacaste region is in dire need of new affordable and sustainable housing solutions. A second site in Pickering, Ontario, was chosen to serve as a local comparison. The two sites presented the challenge of making a housing prototype for two vastly different climatic, geographical, and social conditions. For this charrette, the IwB staff and faculty collaborated with industry experts. In particular, the charrette profited from the expertise of residential development entrepreneurs Andy Napier and James Ruehle, who were interested in developing new residential construction methods in their own practice. 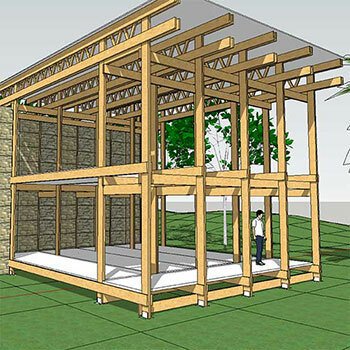 The design challenge was to work within the capacity of current technology and fabrication techniques, but use them in a way that achieves efficiencies in lifecycle costs, demonstrating a model for sustainable, low-cost housing development. The charrette started with a wide overview of existing building typologies. The teams were asked to identify best practices in terms of structure, fabrication, systems, connections, and materials, and to use these findings in their design proposal. The main result of the charrette was the creation of an ‘Open Lattice System’ that is made up of a modular, structural shell, which can be adapted to suit different sites, simplifying the design and construction process. 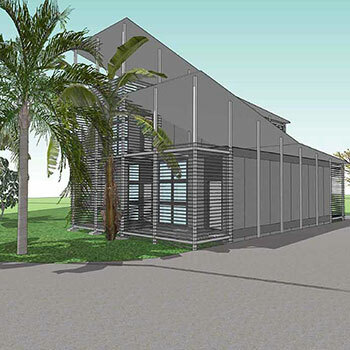 The Open Lattice has a double skin/ envelope that manages extreme climate conditions through a modular shell that can be applied in both extremely hot and cold weather, like that of Costa Rica and Canada. With further modifications in orientation, window placement, and materials selection, the system can adapt to either site, and provide a solution for passive heating and cooling. The basis of this system lies in simple structural components that can be repeated across many applications. These include elements of cladding, systems integration, foundation and roof design, in addition, to spatial organization and site orientation that can be modified each time. The Open Lattice System makes possible design that is filtered and amended according to the demands of different scenarios. With the use of the Open Lattice System, the two proposed housing prototype site variations are similar in structure and form, but distinct in their use of materials, foundation and roof options, as well as systems planning such as energy capture, HVAC, waste and water management. The relatively small size of the structural components allows for a range of floor plan configurations. The effectiveness of the Lattice System is its modularity and adaptability, which contribute in multiple ways to cost-effectiveness, for instance, the system drastically reduces the need for on-site measurements and calculations by trades people. By working with a limited variety of prefabricated dimensional components, site installation is much easier. The work of the two charrette teams produced concrete proposals for two diverse housing prototypes, complete with pricing and shipping information. The Open Lattice System proposes huge improvements to residential building in terms of cost, value, ease of assembly and maintenance, durability, sustainability, mobility, flexibility, applicability, availability, and livability. To find out more about this project, download the Modular Housing System Charrette Report.